In February 1983 in Rochester, NY, I found a set of Comptons Encyclopedias, (circa 1950), bound them together using thick rope, built a pyramidal structure, and hung them in my backyard. The piece is entitled, Books of Knowledge Standing Up Against the Elements that I photographed through seasonal changes and locations wherever I lived. In 1988 I was an artist in residence and guest teacher at Carleton College in Northfield MN, and brought the encyclopedias with me. At the end of the school year, a drunken student sacrificed my outdoor sculpture in a ceremonial bonfire. Fortunately an attentive art faculty member pulled out the books and returned them to me in Brooklyn. 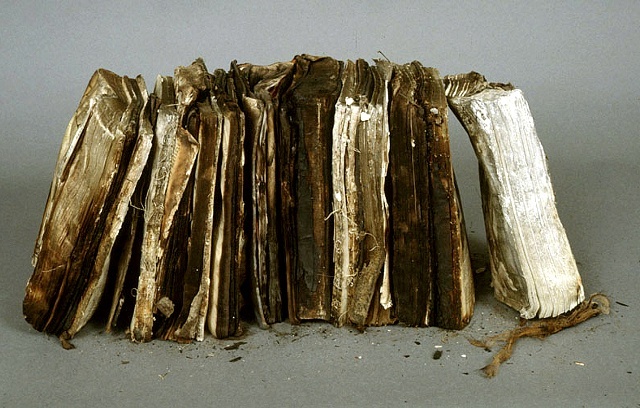 Portions were burnt to a crisp, yet quite beautiful, the charred books were the first bookworks purchased by Allan Chasanoff for his private collection that I eventually became curator of in 1993.